Cobleskill is a village in the western part of the town of Cobleskill in Schoharie County, New York, USA. The population was 4,533 at the 2000 census. The village is southwest of Amsterdam. The State University of New York at Cobleskill is located at the western side of the village. The village was settled in 1752, and was incorporated in 1868. It is generally accepted that a German grist miller named Jacob Kobel (variated as Kobus, or Coble) built a mill on the Cobleskill Creek. The Dutch word for river or creek is kill, thus the name Cobleskill, for "Cobel's creek". The Cobleskill Historic District was listed on the National Register of Historic Places in 1978. According to the United States Census Bureau, the village has a total area of 3.3 square miles (8.5 km²). None of the area is covered with water. A USGS Benchmark on the side of SE corner of the William H. Golding 6-8 Middle School is marked at 1028 feet above sea level. 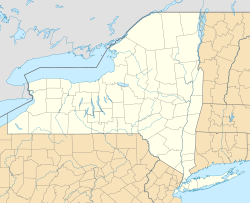 The Valley Cobleskill resides in, is on the boundary of the geologic regions of NY known as the Catskill plateau to the south and the Escarpment region of the Mohawk Valley to the North. Cobleskill is north of the Cobleskill Creek. New York State Route 10 intersects New York State Route 145 at the village. Interstate 88 passes south of the village. As of the census of 2000, there were 4,533 people, 1,537 households, and 794 families residing in the village. The population density was 1,386.3 people per square mile (535.2/km²). There were 1,706 housing units at an average density of 521.7 per square mile (201.4/km²). The racial makeup of the village was 90.75% White, 4.23% Black or African American, 0.24% Native American, 1.39% Asian, 0.07% Pacific Islander, 0.66% from other races, and 1.35% from two or more races. Hispanic or Latino of any race were 3.03% of the population. There were 1,537 households out of which 23.6% had children under the age of 18 living with them, 35.7% were married couples living together, 10.0% had a female householder with no husband present, and 50.9% were non-families. 41.8% of all households were made up of individuals and 20.6% had someone living alone who was 65 years of age or older. The average household size was 2.07 and the average family size was 2.85. In the village, the population was spread out with 15.8% under the age of 18, 32.6% from 18 to 24, 18.1% from 25 to 44, 16.4% from 45 to 64, and 17.2% who were 65 years of age or older. The median age was 27 years. For every 100 females, there were 91.3 males. For every 100 females age 18 and over, there were 89.8 males. The median income for a household in the village was $28,011, and the median income for a family was $43,714. Males had a median income of $29,375 versus $29,712 for females. The per capita income for the village was $15,213. About 11.3% of families and 19.8% of the population were below the poverty line, including 17.8% of those under age 18 and 10.6% of those age 65 or over. ^ a b c d e f "American FactFinder". United States Census Bureau. Archived from the original on September 11, 2013. Retrieved January 31, 2008. ^ Roscoe, William E. (1882). "Chapter II". History of Schoharie County, New York, 1713-1882. Truair, Smith & Bruce Printers and Binders. Syracuse, New York: D. Mason & Co. ISBN 978-0-7884-0060-5. Retrieved April 23, 2009. … the valley of the Cobleskill and its branch the Westkill, was first settled in 1752 and 1754. ^ Simms, Jeptha Root (1845). "Chapter III". History of Schoharie County, and Border Wars of New York. Albany, New York: Munsell & Tanner, Printers. ISBN 978-1-55613-393-0. Retrieved April 23, 2009. This creek took its name after the paternal name of the mill-wright, as Judge Brown assured me. I find the name written Cobels kill in many of the old conveyances, and in all the early Sessions laws, of the state. It is, in truth, the correct orthography of the word. ^ Simonson, Mark (August 2, 2008). "Sunshine Fair growth dramatic over 122 years". The Daily Star. Retrieved July 21, 2010. ^ "2003 Fair Results". AllBusiness.com. Amusement Business. September 1, 2003. Retrieved July 21, 2010. ^ "2010 Grandstand Schedule of Events". Cobleskill Agricultural Society. Retrieved July 21, 2010. ^ "On the Grounds Every Day". Cobleskill Agricultural Society. Retrieved July 21, 2010. This page was last edited on 21 January 2019, at 19:09 (UTC).